Empties have become one of my favorite posts to write and read. Especially since setting a goal for myself, I love seeing how far I've come. Plus, I think finishing a product means that you really know how you feel about it so reviews of empties are always helpful! These are all of the products that I finished in March and at the end of this post I will update my $1000 use-up goal! I bought this years ago at TJ Maxx because I loved the scent, but my hair didn't like it at all. It took so much product to get my hair feeling clean and then a day later it would be oily again, whereas usually I can go two days without shampooing. I finished this up by using it as a brush cleaner, which worked well. 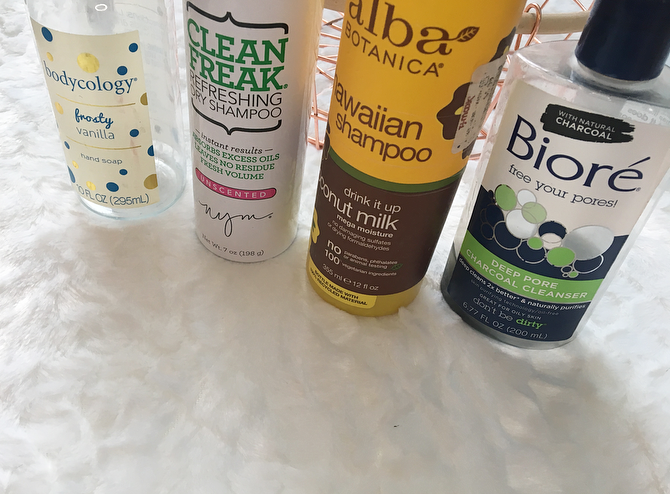 My former favorite dry shampoo from Batiste may or may not be cruelty-free, so I decided to play it safe and try out dry shampoos from brands that I know don't test on animals. This one was okay and I have repurchased it, but I do prefer the Batiste one. If you have any recommendations please let me know! I've used this for years because it took off my makeup really well, but now that I've discovered micellar water I'm looking for a more gentle cleanser! I have a few samples to use up so I will finish those before looking for a new cleanser. Usually I don't include hand soaps in my empties posts, but I received this one as a gift so I consider it "my" product if that makes sense. I liked the scent a lot, it was a unique minty vanilla that was perfect for winter. Several people recommended this mascara to me and it didn't disappoint! I really liked it for lengthening and defining my lashes, but sadly I won't be repurchasing it and I'm still on the hunt for my perfect drugstore mascara. This is a really great mascara! Funnily enough, I've never purchased this mascara but it has come in so many Too Faced sets, subscription bags, and free gift with purchases that I've gone through at least five samples of it. I like it a lot but I don't see myself purchasing it in the future because I have a ton of mascaras to get through. If you make small mistakes with mascara or winged eyeliner, I think this is a great product to fix small problems. It dries out pretty quickly but it helps me salvage my wings in a pinch. I will repurchase it soon! I've seen it at TJ Maxx for a small discount so I'll definitely check there first. Also, if you find that the tip is dirty, you can flip it over and get a few more uses out of it! This is my all-time favorite lip balm! It smells like sunscreen and reminds me of the beach, I absolutely love it and have gone through four or five tubes. I'm definitely going to repurchase eventually but I would like to focus on some of the other lip balms in my collection first. I received this in an Ipsy bag ages ago, I think in my very first bag back in 2016, so this little sample lasted me a long time! Granted, I didn't use it every day but I definitely could decide whether or not I liked it based on this sample. It was nice for moisturizing because it absorbed really quickly but I don't think that it's anything special. I prefer my moisturizer from the Ordinary. Influenster sent this to me along with two other ChapStick Duos but this was my favorite out of the three flavors. I think that it's watermelon but there is nothing on the container to tell me which one it is! I wouldn't repurchase this but I think it's a fun concept and it's good for lightly hydrating the lips. They have a lot of flavors to choose from. I also finished some products in my Project Pan but I will talk about those in my next update! If you've been following my empties series in 2018 you will know that my goal is to finish up $1000 worth of product this year. In March I used up a grand total of $59.93. My previous total from January and February was $245.51, so now I am at $305.44! I think I'm doing pretty well but I want to step it up in the next few months. Have you finished anything big this month? 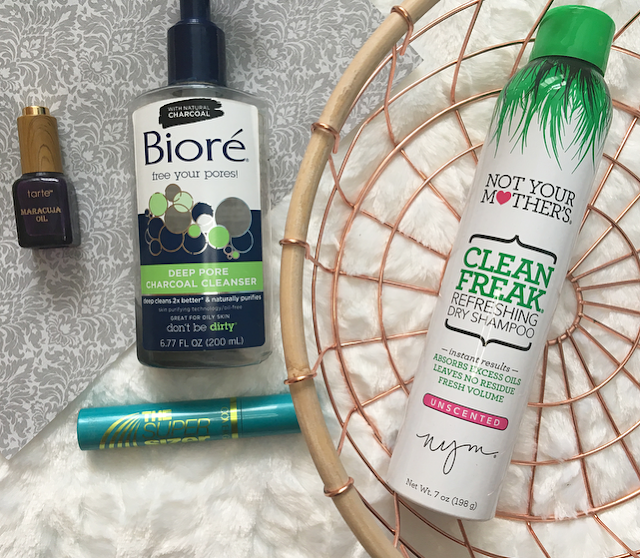 15 comments on "March Empties"
I always repurchase Dove or Batiste's dry shampoo but I love switching it up and trying new ones! I've never heard of the Not Your Mother's Clean Freak dry shampoo so I might try that out. Thanks for sharing! Love empties! I feel like they're always so honest! I will have to try that maracuja oil, I've heard so many good things! So many empties here, I love having a nosey and seeing what other people have used! I’ve been meaning to try that biore cleanser! So glad it worked. I have so many products to finish but I can’t do it, seems impossible haha!! I am currently using the Biore cleanser, it’s really good and effective!!! I'm a massive fan of that Biore charcoal cleanser, its so good! 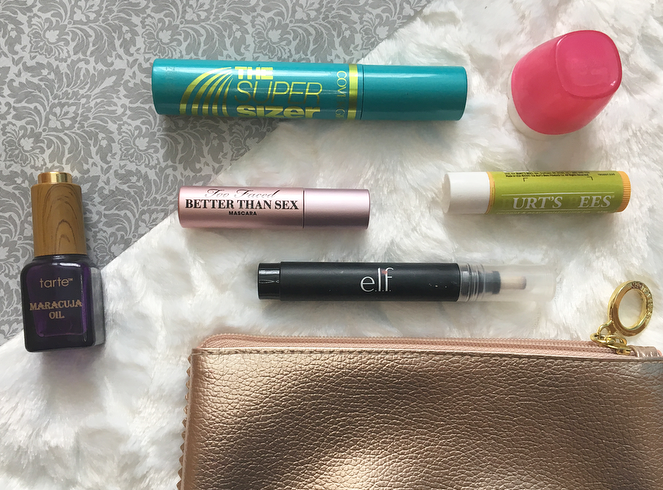 You are doing so freaking well with your empties! I am trying hard but damn, I'm not doing very well. LOL!